Xenia’s Kamea Baker (10) puts up a score in Wednesday’s 54-29 loss to visiting Greenville. Baker scored a game-high 20 points. Greenville’s Haleigh Mayo-Behnken (2) blocks Haley McManus’s shot in the first half Jan. 16 in a girls high school basketball game at Xenia High School. Xenia’s Olivia Wakefield drives in for a score against Greenville defender Annie Hayes, in the seond quarter of Wednesday’s Greater Western Ohio Conference girls high school basketball game at Xenia High School. 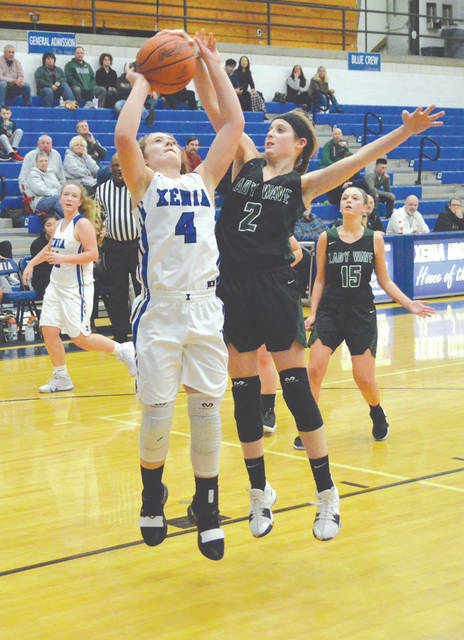 XENIA — Despite the 54-29 home Jan. 16 loss to Greenville, Xenia High School coach Jamie Hand remained optimistic that his girls basketball team’s shots will start to fall. Very unofficially, Xenia (1-13, 1-7 Greater Western Ohio Conference South) hit on 10 of its 44 shots from the field (23 percent). The Buccaneers didn’t fare much better at the free-throw line, where they converted 6 of 14 tries (42 percent). “I think this game has been the way our last few games have gone,” Hand said. “We’ve played as hard as our opponents have played, and we’ve executed as well. … But they hit more shots. Greenville did a good job tonight. They’re well coached. They ran their sets, and they did a good job of hitting their shots. Haleigh Mayo-Benhken led the Green Wave (6-7, 4-5 GWOC North) with 18 points scored, and fellow junior Morgan Gilbert drained three 3-pointers as part of a 13-point night. Four other Greenville players combined for the other 23 points. Green Wave coach Rachel Kerns was especially happy with the way her team played defense in Wednesday’s win. In the turnover department, Greenville committed 11 turnovers to 21 for Xenia. 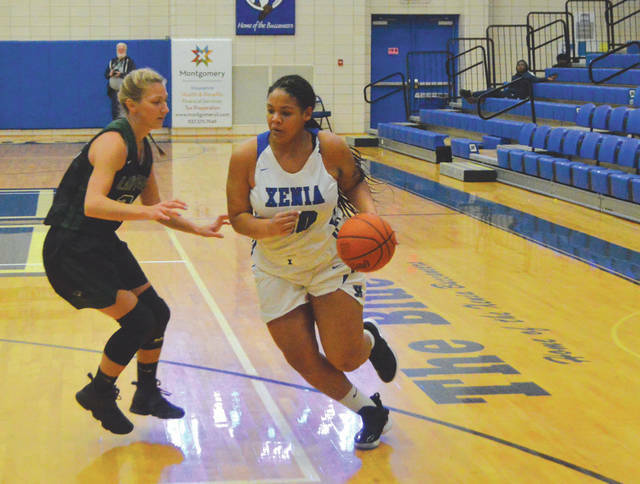 Greenville’s team effort over-shadowed Kamea Baker’s 20-point scoring night for Xenia. The Bucs sophomore turned in her second-best scoring night of the season thus far. Her best of 23 points scored came on Jan. 5 in the team’s lone win over Sidney. 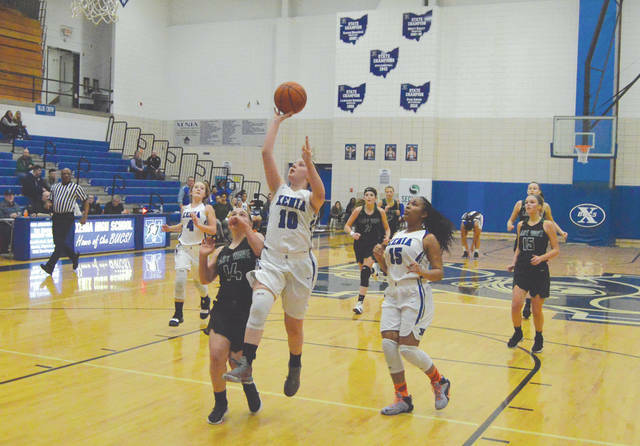 Olivia Wakefield added seven points for Xenia, while teammate Haley McManus had two. Xenia has a busy week. They’re scheduled to host Stebbins for a GWOC South contest at 7:30 p.m. Thursday, Jan. 17. The Bucs then are slated to head north to Vandalia for a rare 6 p.m. Friday, Jan. 18 contest. Greenville will close out its week with a scheduled 1:30 p.m. afternoon game at home against Stivers.